Although Cristina Ortiz has been resident in the UK for many years, it is the passion, spontaneity and allure so characteristic of her Brazilian cultural heritage, which are central to her music-making. During more than 25 years as an international concert and recording artist she has developed a unique bond with audiences all over the world, with the result that she has become one of the most popular and repeatedly sought-after soloists. That passion encompasses the broadest range of repertoire – and a commitment not only to solo recitals and concertos but also to chamber music with partners such as Antonio Meneses, Truls Mork, Kurt Nikkanen and Uto Ughi. It is also a passion, which she has an enviable gift for communicating through masterclasses and workshops – proving a source of real inspiration for students throughout the musical world. In recent years Ms Ortiz has particularly turned her attention to performances in which she directs from the keyboard – in concert, for example, with the Prague Chamber Orchestra at Vienna’s Musikverein and on disc with the Consort of London on Collins Classics. At the same time she has continued to work with the greatest conductors – including, for example, Vladimir Ashkenazy, Neeme Järvi, Mariss Jansons, David Zinman – and orchestras such as the Berlin and Vienna Philharmonic, Cleveland Orchestra, Chicago Symphony, Czech Philharmonic and Philharmonia. In concerts and recordings her commitment to Brazilian music is well-evidenced – from the five Villa Lobos piano concertos which she has recorded for Decca to the very successful American premiere in 1996 of Guarnieri’s “Choro” at Carnegie Hall under Dennis Russell Davies. 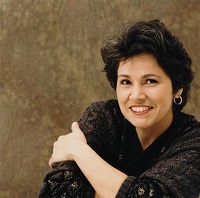 At the same time she has enjoyed sustained public and critical acclaim for her interpretation of a wealth of the most significant piano literature – from Beethoven to Bernstein; and she has also brought to the public’s attention a number of important but lesser known works, including, for example, a recording of solo piano pieces by Clara Schumann made in 1997 for Carlton Classics.